With the presidential election just two weeks away, the latest Fox News poll has Hillary Clinton’s lead over Donald Trump at only 3 points. Two weeks ago Trump trailed by 7%, one week ago he trailed by 6% and now The Donald only trails by 3%. Poll trending at the end of an election means every thing. One has to wonder, with all the negative coverage from the MSM toward Donald Trump and their willingness to carry the water for Hillary Clinton, how is it that she is only ahead by 3? With less than two weeks to go, the race for the White House has narrowed as Hillary Clinton now has a three-point advantage over Donald Trump. That’s within the margin of error of the national Fox News Poll of likely voters. Clinton is ahead of Trump by 44-41 percent. Another one-in-ten back a third-party candidate and four percent are undecided. Last week she was up by six points (45-39 percent) and before that by seven (45-38 percent). The poll, released Wednesday, finds Clinton leads 49-44 percent in the head-to-head matchup. That 5-point advantage is at the edge of the error margin. She was up 7 a week ago (49-42 percent). Trump is helped by increased backing among independents and greater strength of support: 68 percent of those backing Trump support him “strongly,” compared to 61 percent for Clinton. What is up with the national polls that were recently released and how could there be that much of a difference in the polling? We will know for sure come the day after the election, which ones got it right and which ones blew it. The polls were anywhere between Clinton +1 and Clinton +14. With such polls that are obviously false, one cannot even take the RCP average as a correct barometer at Clinton +5.4%. Personally, I would throw out the AP, ABC tracking and USA Today, there is no way any candidate would win by such absurd amounts. Those polls are meant to discourage voter turnout for Trump and the MSM playing games. At this point with Trump gaining on Hillary, in part because of the devastating Obamacare premium truth, Hillary is ahead by 2-3.5%. 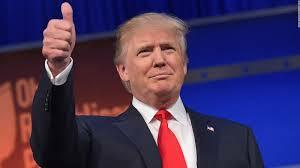 According to the most recent FOX News polls, Donald Trump is surging in the polls and leads Hillary Clinton in three key battleground states, Nevada, North Carolina and Ohio. The key is that not only is Trump ahead in these battleground states, but he has the momentum at the right time and is surging. Meanwhile, Hillary Clinton seems to have come to a halt and only has a complicit, bias and water carrying media propping her up. 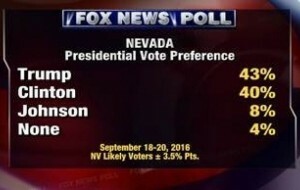 Trump surges in Nevada, Donald Trump holds a 3-point lead over Clinton among likely voters in a three-way race that included Gary Johnson, the Libertarian nominee. Trump has 43% of support, Clinton 40% and Johnson’s 8%. 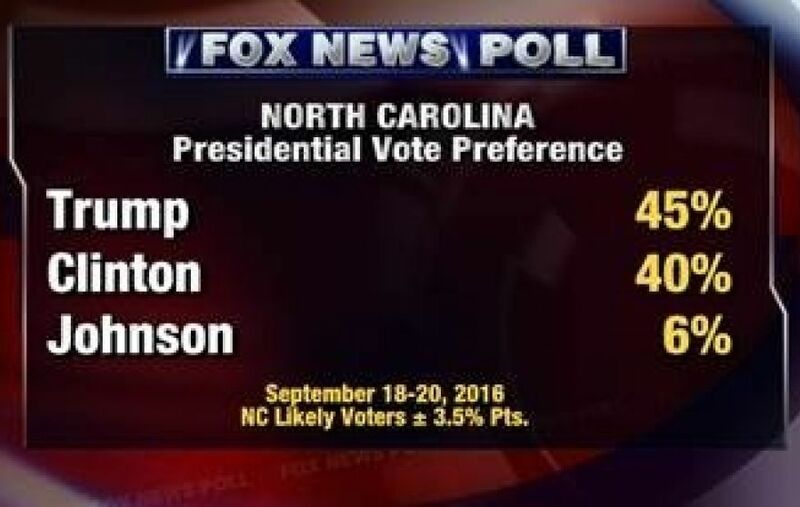 In North Carolina, Trump was up by 5 points, leading Clinton by 45% to 40%, with Johnson at 6%. 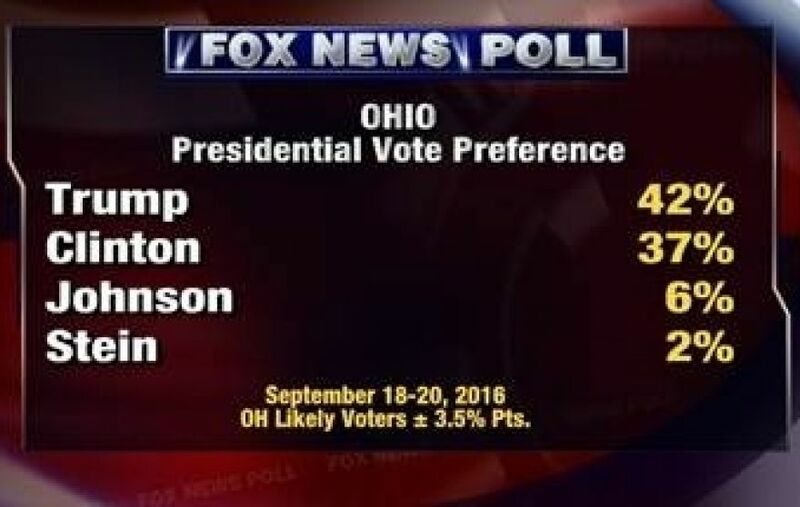 In Ohio, Trump has a 5-point lead over Clinton, with 42% of support. Clinton has 37% in a four-way poll that included Johnson and Jill Stein, the Green Party nominee. Interestingly enough, Obama won Nevada in 2008 (55%-43%) and 2012 (52%-46%), Ohio in 2008 (52%-47%) and 2012 (51%-48%) and North Carolina in 2008 (50%-49%). Hillary Clinton is under-performing in states that Obama easily won in the past. Trump has a three-point advantage over Clinton among likely voters in the Silver State (43-40 percent). Libertarian Gary Johnson receives eight percent. 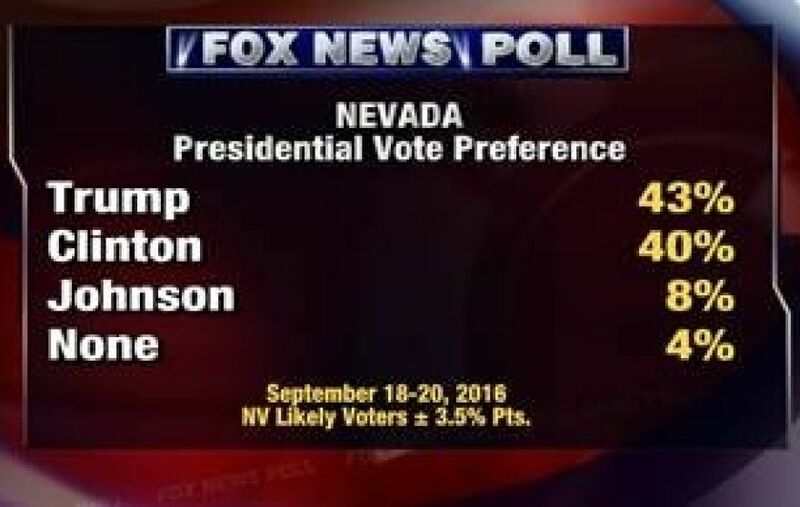 Nevada voters also can cast a ballot for “none of these,” and that option takes four percent. Green Party candidate Jill Stein is not on the ballot in Nevada. Independents back Trump (42 percent) over Clinton (23 percent) and Johnson (21 percent). The Democrat is trailing expectations among women and younger voters. In North Carolina, Trump is up by five points among likely voters. He receives 45 percent to Clinton’s 40 percent, and 6 percent favor Johnson. Stein is not on the ballot. Whites back Trump by a 31-point margin (58-27 percent), while blacks support Clinton by 82 points (85-3 percent). Independents favor Trump (41 percent) over Clinton (24 percent) and Johnson (14 percent). The Buckeye State is another must-win for Trump, and the poll finds him up by five points among likely voters: 42-37 percent. Johnson receives six percent and Stein gets two percent. The most recent FOX poll shows it is a dead heat between Donald Trump and Hillary Clinton. Interestingly enough, this is the first Fox News Poll this season that includes results among likely voters. Previous polls were registered voters. However, make no mistake about it, the presidential race has swung dramatically in the last 6 weeks and Trump has all of the momentum. The RCP average polling is proof positive that Hillary’s lead is all but gone and Trump is starting to go ahead in some polls. Full results can be read HERE. The presidential race is tight. Hillary Clinton tops Donald Trump by just one point among likely voters in the four-way ballot. In the head-to-head matchup, Trump’s up by one point. Clinton receives 41 percent to Trump’s 40 percent, according to a new Fox News Poll, with Libertarian Gary Johnson at 8 percent and Green Party candidate Jill Stein at 3 percent. In a two-way matchup, likely voters give Trump the edge over Clinton: 46-45 percent. The poll, released Thursday, was conducted Sunday through Wednesday evenings, at a time when Clinton faced new questions about her health after falling ill at a 9/11 memorial event. 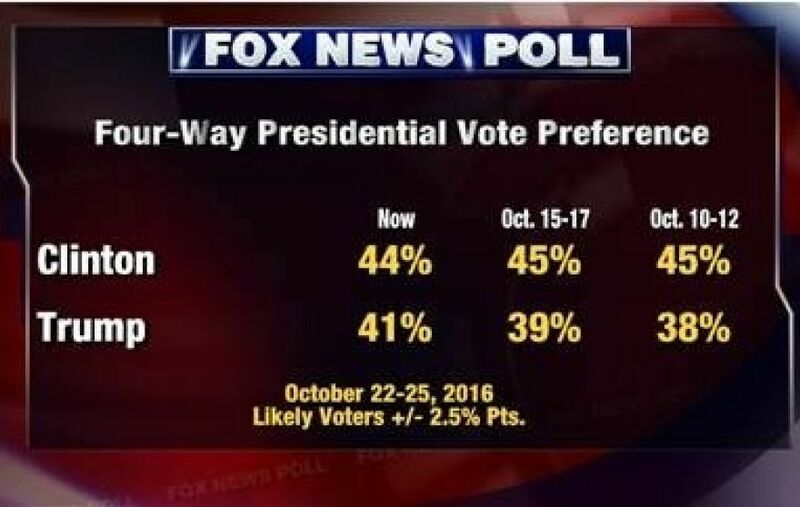 It’s the first Fox News Poll this season that includes results among likely voters, so a direct comparison can’t be made to previous polls. 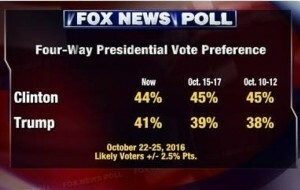 Fox News Poll: Donald Trump Tops Hillary Clinton, 45% to 42%, 10 Point Swing in One Month!!! In the most recent FOX News poll, in a hypothetical match up between Donald Trump and Hillary Clinton, the Trumpster leads the truth-challenged Hillary Clinton 45% to 42%. The hypothetical match-up is all but a forgone conclusion, unless Hillary Clinton is indicted. Hard to believe that the Obama administration would do that. What is most remarkable about the poll is that last month, Clinton was up by 48-41 percent. That would be a 10 point swing for the common core educationally challenged. 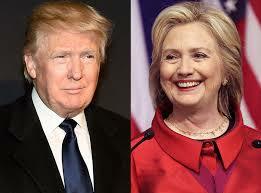 Donald Trump tops Hillary Clinton in a hypothetical head-to-head matchup, according to a new Fox News Poll that also finds majorities of voters feel both frontrunners lack strong moral values and will say anything to get elected. Trump has a 45-42 percent edge over Clinton, if the presidential election were held today. That’s within the poll’s margin of sampling error. Last month, Clinton was up by 48-41 percent (April 2016). Clinton is ahead by 14 points among women (50-36 percent). Yet Trump leads by a larger 22 points among men (55-33 percent). He also tops Clinton by 37 points (61-24 percent) among whites without a college degree (working-class whites).